Yes, another 6V6 amp project. But with some added features. The power amp section will be 6V6-PP-CC-UL. The driver-inverter will be an OP275. This amp was greatly modified by Peter, and Flip. Last edited by john8750 on Jan Tue 02, 2018 7:17 am, edited 4 times in total. Last edited by john8750 on Jan Tue 02, 2018 7:19 am, edited 1 time in total. One twist will be a tone control circuit. You must really like your cousin! Hi Mike. He is a real nice guy. We live close and have always been good friends. And I have most all the parts left over from other projects. My 300b is completed, just need better speakers. for this one, so should build fast. Here is another section I will add just for the MP3 low level boost. Thanks to Flip. The grid leaks need to be inserted. I believe it should be 470K. Will check with Peter. And, I believe it should connect before the stopper. Here is the wood chassis I will use. Just need a few changes. A different power transformer will be needed. And 3 sets or input jacks will be installed in the rear. I would like to add a remote volume control, but don't know if there is enough room. I built a test circuit of the tone control circuit. Works very well. You can see the actual PCB it will be built on at the top of photo. The TDA1524A has perfect authority of the preamp functions. It will be a tight fit, but ordered this remote control volume pot. I will take a gamble for the price. Here's the power supply with more 'practical' values for the caps, namely C2, C3 and C4. It has slightly lower ripple too. A more efficient PS would be to use a transformer full wave doubler rather than a cap doubler (which is half wave) for B+. The objection that some have is that the heater supply gets it's return to the transformer through the bottom 470 uF cap (the reason it's non symmetrical with the upper 220 uF) but, as far as I can tell, that's purely 'visual' and has no detrimental effects on performance. Edit: Corrected C5/C8 caps. Edit 2: C5/8 were correct after all. Last edited by Flipperhome on Jan Wed 03, 2018 10:21 pm, edited 2 times in total. Thanks Flip. You caught me just in time, was laying out the power supply. T1 400ma ok? That's what I have already installed. No, 400 mA isn't enough. 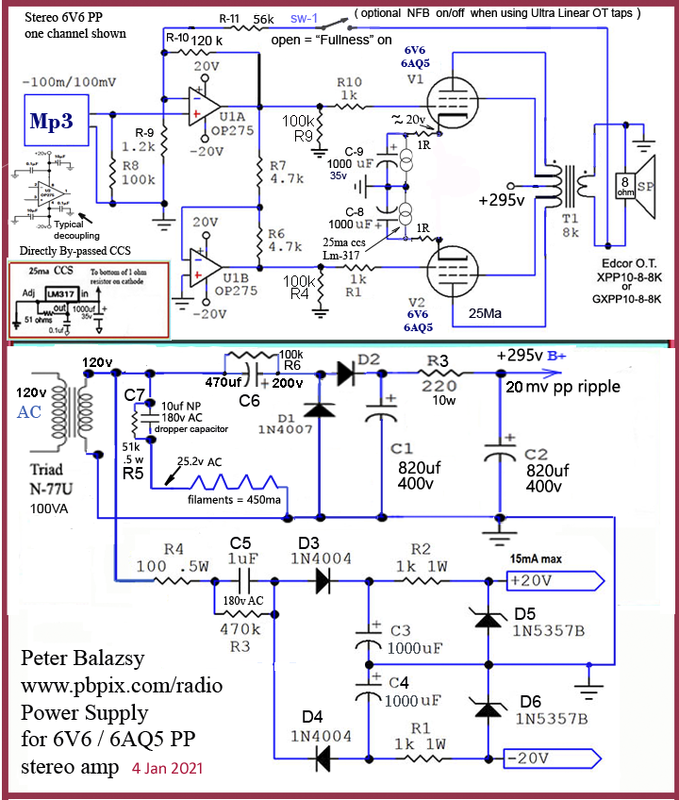 It really depends on which version you choose and the idle current of the 6V6s but a Triad N-77U is about minimum. R1,2 should be 5 Watt, or more. C1-4 again depend on which circuit you pick. For the cap multiplier circuit C1 can be 200 V but the rest should be 400 V. For the transformer multiplier C1 and C2 can be 200 V with C4 and C4 400 V.
50 V is fine for C6 and C7. Rats. I made a boo-boo on one of the schematics. C5 and C8 should be non-polar. I'll go back and edit that. Thanks Flip. Just wanted to be sure. My mistake about the PT. I was forgettin the filaments. And thanks peter for the accurate 6V6 schematic. I replaced the one I had with the update. Remember when I tried to implement the full-wave version... there were problems? Something to do with C2... or such. Remember it didn't work... so I had to abandon it? Do you remember what it was? I'm foggy about the exact details.